Brush Strokes is a fun new background and pattern building set. 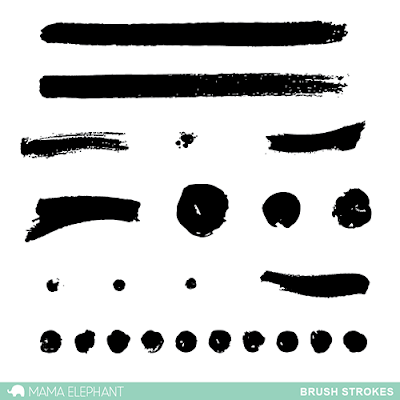 The brush strokes gives a great organic feel to the traditional polka dot! You can create a seamless pattern like this card here. 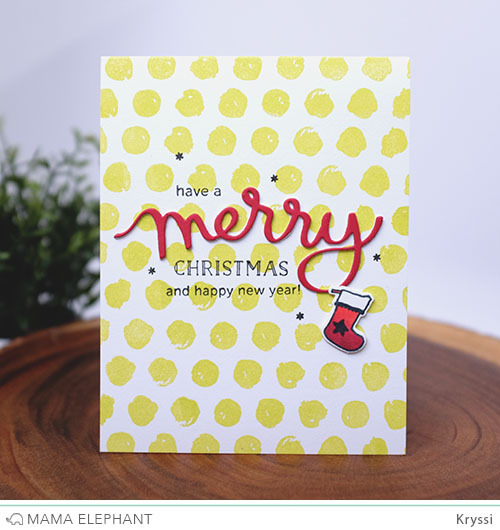 I also used the new Merry Script Creative Cuts die. It was cut three times and stacked for a teensy bit of a 3d look. The stocking is from Festive Mice. I also pulled out my Jolly and Merry stamp set to finish the sentiment. I LOVE how this card turned out! You can also use the single brush image son this set to create a fun card like this here. I think the brush strokes look really fantastic in our pigment inks! The sentiment and the little ornaments are from the new Jingle Greetings! I love it, the yellow repeat background is fab! It was so nice to meet you all in NY yesterday, and I am happy to say I am now the proud owner of this stamp set, and lots more Mama Elephant goodies! these stamps are awesome!! I love the watercolor look! What an awesome idea! Perfect for making backgrounds and decorating my PL cards! I cannot wait until I get my hands on this set. Ideas are running through my head. I like the dots and I am a fan of circles and yellow is my favorite color. That being said, I'm not sure I like the yellow for Christmas though. That's just me though. I would have done them red and green. I do like how it looks and I love the script. I wish I could get a stamp made with my handwriting. People are always telling me I have really nice handwriting and I think it would look nice on a script stamp. Nice job! Both cards are awesome. Love the brush strokes, and the dots, and I agree.. they look great with the pigment inks.. Well done. Love the hand done look of the polka dots, very useful set for making water colour effects without the stress. Another set I Must Have.